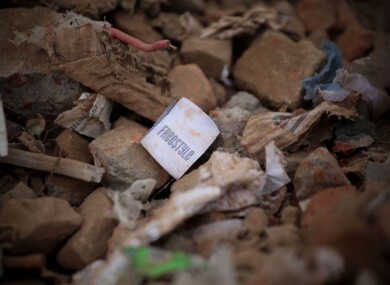 A clothes tag sits among the rubble of the Rana Plaza factory collapse. BANGLADESHI POLICE HAVE charged the owner of the Rana Plaza factory complex with murder over the 2013 building collapse that killed more than 1,100 people. Factory owner Sohel Rana, 35, is among the 41 people facing the death penalty if they are convicted for the developing country’s worst-ever industrial disaster. Those charged also include Rana’s parents, who jointly owned the building, and the mayor and councillors of the town in which it was built. Police also called for arrest warrants to be issued for six government officials who absconded before they could be brought in. Lead investigator Bijoy Krishna said all of those charged had “collective responsibility” for killing over 1,100 innocent people who died under the rubble. “Rana Plaza was built flouting construction rules and it was extended without proper structural changes. And when it was turned into a factory complex, it was loaded with heavy machinery such as a generator. No wonder the building collapsed,” he said. Primark, which trades as Penneys in Ireland, was one of several western fashion chains which had clothes made at Rana Plaza before the disaster. Other brands included Italian label Benetton and Spain’s Mango. Last year the company began paying $10 million in compensation to both surviving workers and family members of those killed in the factory collapse, on top of emergency food and aid it earlier promised. Survivors have recounted how they had been forced to enter the compound on the day of the disaster despite complaints that cracks were appearing in the walls. Rana and 17 others were also charged with breaking building codes for extending the six-storey building, which was approved for use as a shopping centre, into a nine-storey factory. Email “Factory owners charged with murder over collapse that killed 1,100”. Feedback on “Factory owners charged with murder over collapse that killed 1,100”.